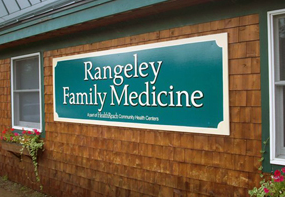 Since 1994 Rangeley Family Medicine has been serving the Rangeley Lakes Region. At our health center we work together with patients of all ages to provide a ‘medical home’ and utilize the most up-to-date technology and resources. Click here to learn more and to watch a video: Patient-Centered Medical Home. Our staff includes a team of medical providers and behavioral health consultants, as well as clinical and administrative support staff. With our team we are able to offer a variety of services including routine physicals, chronic and acute medical visits, laboratory services, and minor surgery. Serving local residents from Rangeley, Dallas and Lincoln Plantations, Madrid, Magalloway, Sandy River, and other surrounding towns, Rangeley Family Medicine offers access to the hundreds of lakes, ponds, streams, and acres of wild forest in the region. The town is at the center of the Rangeley Lakes Region with many hotels, campsites and boat launching facilities. The region is renowned for hunting, fishing, hiking, skiing, and snowmobiling. Snowmobiling in Rangeley has become such a large part of the community that in January there is a 3-day celebration, Snodeo, of all things snowmobile related.